By virtue of shifting creative teams, the New 52 Green Arrow series has ended up with some odd-sized trades, of which Green Arrow Vol. 6: Broken is the latest, at three issues, the Futures End tie-in issue, and a Secret Origins story. But here again are the creative team of Jeff Lemire, Andrea Sorrentino, and Marcelo Maiolo, so even a short trade is a stunner. Lemire's concluding Green Arrow story is perhaps a tad small in scope for a finale, though in three issues Lemire effectively bridges the gap between his run and the next (and pays some deference to the Arrow TV show), so maybe that's sufficient. All this and, from one of the architects of Futures End, a tie-in that actually relates to the series itself. 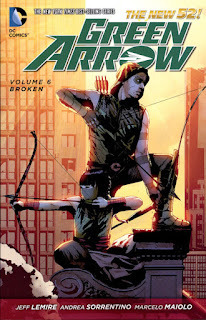 The stakes of Broken pale in comparison to Green Arrow Vol. 5: The Outsiders War -- the latter being a tale of a thwarted mass casualty event and the former being a more personal attack on Green Arrow proper. At the same time, Lemire makes a good argument for Broken as an almost-conclusion to the New 52 Green Arrow with villain Richard Dragon's callbacks to the arrival of the Justice League. Dragon notes that "men could fly in Metropolis ... yet Green Arrow stood shoulder to shoulder with them. A normal man who had made himself into something more ... he showed me I could do it, too." Though the implication is that Green Arrow Oliver Queen inspired Dragon to villainy, it's still a fine thesis statement on Green Arrow's utility as a DC Comics hero at the point in which one chapter closes and another opens for the character (almost, with Green Arrow Vol. 7: Kingdom by Arrow's Ben Sokolowski and Andrew Kreisberg serving as the actual New 52 break point). It's mildly controversial, as these things go, that Lemire re-casts Richard Dragon -- long-time DC Comics kung-fu mystic -- as the New 52 mobster villain of the piece, though Lemire fleshes him out well in Broken. This Dragon actually turns out not to be the Richard Dragon (and Lemire leaves the door open for that classic character to appear elsewhere), but rather the vengeance-crazed son of drug lord Ricardo Diaz, who John-Diggle-as-Green-Arrow took down some years earlier. A certain amount of confluence with the Arrow show has been grafted on to the New 52 Green Arrow series retroactively, and this ultimately Diggle-focused villain allows Lemire to spotlight Diggle and fill in some of the newly-created gaps in Green Arrow's DC history. Lemire bridges to Arrow well with the re-establishment of Oliver Queen and John Diggle's relationship. The two have a particularly wry exchange in an elevator -- and then come out against the bad guys with guns and arrows a'blazing -- in a scene that felt particularly true to Arrow's tone. As well, that Lemire has Oliver feeling guilty over having left Seattle in order to go stop the aforementioned mass killing in Prague seemed a bit of a stretch, but its purpose -- you guessed it -- is to allow Green Arrow to reflect on having "failed this city" before ultimately triumphing over Dragon. The Futures End tie-in is one of the minority that actually relates to the Futures End story proper instead of just being a futuristic Elseworlds tale. Additionally the issue is a rare spoilerly prologue to Futures End, a distinction as far as I can tell only shared with Aquaman and the Outsiders, all of this due to Lemire and writer Dan Jurgens respectively also writing for the weekly series. Given Broken's street-level focus, the Futures End's issues return to the Outsiders is a nice counterpoint epilogue; the issue also calls-back itself to one of the best cliffhangers of Lemire's run. There's no mistaking that Green Arrow Vol. 6: Broken reads short because it is short. The Secret Origins story, though well drawn by Denys Cowan with Bill Sienkiewicz, comes off as filler; in Secret Origin's attempt to avoid spoilers, the breezy recounting of Green Arrow's origin glosses over a number of details that anyone really needing the origin would want for understanding this book. But Lemire's got these characters' voices solid in the main story, and the action is beautifully depicted by Sorrentino as always. There's a faux over-excited kung-fu movie style to the flashbacks that's not in Lemire's script, reprinted at the end; if that's Sorrentino's contribution, then it's a nice touch. Likely reading Lemire's whole run in the deluxe edition would negate some of these pacing problems, and that's certainly what I'd do if I didn't already have the individual trades.